Attractants and cover scents come in a wide variety.Walking down the deer attractant isle at any store will start to make your head spin with all the different kinds of attractants and cover scents available. I have used several in the past and I will continue to use them in the future. Every deer hunter knows that the best advantage that you can have during the season is to fool a deer's sense of smell. 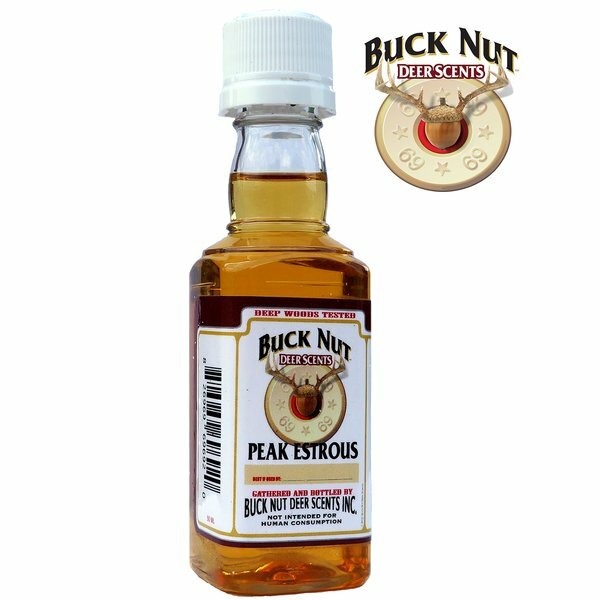 I was given the opportunity from Buck Nut Deer Scents to review their product The Peak Estrous and The Peak Rut. The first thing that I noticed when I received the package is the cool bottles they come in. 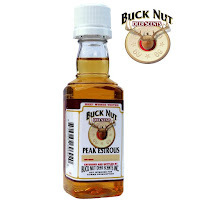 They look like a little shot of alcohol but once you open it you'll quickly discover it's not worth drinking. The bottles definitely are unique and make for a great conversation starter too. The biggest advantage that I have seen is that they use urine from a single doe or buck to make the attractant. A lot of the larger companies gather the urine from a variety of deer and it is blended together. I like what they do because instead of "just having scent out", you are creating a constant "challenger" for the deer in your area. They will smell and recognize that there is either a challenger or a hot doe nearby. I have had some opportunities to hunt some great property here in Missouri, but hunting the public land here has been a big learning curve. It can be very challenging to say the least. Constantly battling with other hunters to find a spot for deer. It's not impossible but it is a challenge in and of itself. I did find a spot that I was able to put some of this out and I don't think it was a coincidence that I ended up seeing a doe pass through with a buck hot on her tail. They were both following the scent trail that I put up. The unfortunate thing was that I rushed my shot and missed on the buck. Overall I would have to say that by putting this out on a constant basis during the rut is a definite advantage. Be sure to check them out at www.BuckNutDeerScents.com and check out their attractants and their cover scents. A great company to work with and excellent products! As with all reviews on High Country Bowhunter, the following review is my honest opinion, I received the Peak Rut and Peak Estrous free of charge and agreed to provide a review in exchange. 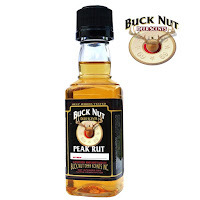 I am not sponsored by or associated with Buck Nut Deer Scents and accepting no other compensation, monetary or otherwise, in exchange for this review. My independent status may change in the future but, as of the date of publication, no relationship other than described above has been pursued or established.